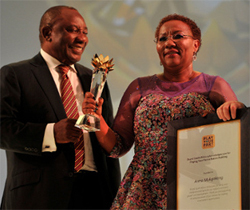 One of South Africa's most inspiring businesswoman and philanthropist, Dr Anna Mokgokong, was on 9 April 2015, honoured with the Lifetime Achievement Award at the 2014/15 South African Premier Business Awards. The awards, hosted by the Department of Trade and Industry (DTI) in partnership with Proudly South African and Brand South Africa, recognise business excellence and honour enterprises that promote the spirit of success and innovation as well as job creation, good business ethics and quality across all business sectors. Dr Mokgokong is chairperson of Community Investment Holdings and AfroCentric Health Group, leaders in sustainable healthcare. She also holds a multitude of noteworthy accolades as well as additional executive portfolios and directorships at some of South Africa's foremost organisations. As the first black female non-executive director of Shoprite Checkers, the largest retailer in Africa, and the only director with three JSE listed companies, Dr Mokgokong steers a business empire that spans healthcare, technology, logistics, mining and energy. "I am truly humbled and honoured to accept this lifetime award. I thank the Minister of Trade and Industry Rob Davies and the government for this recognition and for their endless efforts to help grow entrepreneurs," says Dr Mokgokong. "The journey of entrepreneurship is not an easy one and I also commend all entrepreneurs for choosing this courageous path. Entrepreneurship is key to resolving a number of our challenges as a country, it can help deal with challenges of unemployment by creating employment opportunities that can transform and empower our communities," she adds. A medical doctor by profession, Dr Mokgokong's passion for healthcare was cemented at an early age and after graduation in the early 90s, she used capital she had generated from a lucrative sideline business selling handbags, to establish the Hebron Medical Centre in the Northwest. Overcoming numerous obstacles, she built the centre from a zero-base into a primary healthcare and baby welfare clinic servicing over 40 000 patients. This was to be the first of many successes within the medical arena, securing Dr Mokgokong a place among South Africa's major players in healthcare. In addition to her impressive business successes, Dr Mokgokong's passion for community development and women empowerment was also recognised at the awards ceremony. The Minister of Trade and Industry considers an exceptional individual with an outstanding track record for the Lifetime Achievement Award, who has actively contributed significantly to South Africa's economic development for no less than 30 years.